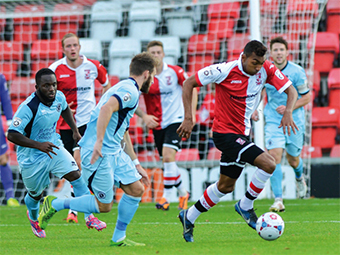 WOKING found their way out of the wild Wood at Kingfield on Saturday with a tough 2-1 triumph in the FA Cup. Cards made the draw for the 1st Round proper of the old competition for the first time in four years courtesy of a special moment for one of their home-grown saplings, Giuseppe Sole, who finally felled a feisty visiting Boreham Wood side. Sole, 26, has blossomed since making his first-team debut as an 18 year-old and marked the cup occasion appearance by grabbing his landmark 100th goal in the famous red and white halves. Sole’s goals could prove to be inextricably linked to Woking maintaining their form on all fronts during a season which has started impressively for both player and club alike. Indeed, assistant boss Steve Thompson – a famous Cards cup scorer himself against Coventry City in the Nineties – has challenged Sole and this current Kingfield crop to bring those famous cup nights back to the old ground. “The FA Cup is important. It’s important financially for a club; it’s in the publicity that it can get you and that can help you with your league progress as well to keep the momentum going. It can help in all sorts of ways,” said Thompson in the lead up to the qualifying round tie. Traditionalists have voiced their concerns in recent times over the magic of the cup being lost, but there could be no such complaints here with both sides lining up 4-4-2 for a Saturday, 3pm kick-off – Wood even sporting one-to-eleven shirt numbers in a refreshing nod to yesteryear. Gaffer Garry Hill and Thompson made use of the tie against lower league opponents to reintegrate his recuperating players: goalkeeper Jake Cole (calf), James Clarke (groin), plus seasoned cup campaigner Kevin Betsy (knee) made up three of six changes to the starting XI which had lost to bottom of the Conference AFC Telford United the previous Saturday. Visitors Wood could well be back in league action at Kingfield next season, and Ian Allison’s young side certainly brought with them the form that has seen them climb to the top of tree in the Conference South. Livewire forwards Junior Morias and Luton loannee Lee Angol certainly seem capable of scaling the Non-League pyramid on this showing, with the pacey strike duo testing Cole’s match fitness in an open first half. It wasn’t merely one-way traffic, however. John Goddard motored the home side up to the Lesley Gosden end on the counter attack, finding Betsy, who had kept pace with the play only to run out of steam with a tame shot on James Russell’s goal. Betsy turned provider on the stroke of half time for fellow marauding midfield Keiran Murtagh, whose side-footed effort inside the box again lacked the necessary ‘oomph’. Goddard almost started the second period with a bang as he fizzed a big dipper of a half-volley out of the sky from 25 yards, forcing Russell into evasive action. Cue Sole to light the fuse two minutes later, as the Cards fans favourite gobbled up golden goal 100 – Sole, soaring above two Wood defenders, thumped home a header from a delicious Adam Newton centre. Boreham Wood hit back with an immediate equaliser to dampen the fireworks somewhat. Straight from the restart Ricky Shakes shook Kingfield by tapping in from a yard out after a teasing Graeme Montgomery switch from the left. 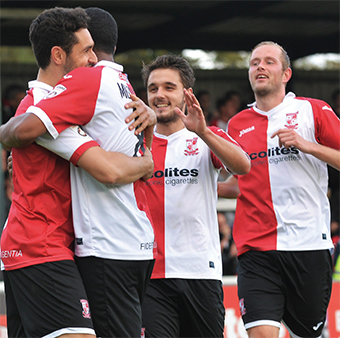 But the fiery five minutes weren’t over yet, as Sole reignited the Woking flame once more, to claim goal number 101. Again, the firestarter used all of his 100-goal nous to add a sublime finishing touch to another full-back’s cross, this time steering home a side-foot finish from a Chris Arthur cross. Captain Mark Ricketts took the post-game Q&A, joking that boss Hill was trying to give his crocked skipper something to do to pass the tedium of his spell on the sidelines with a nagging knee injury – which Ricketts admitted ‘could take a good few weeks yet’ to clear. “I don’t think we played that well today. I think the boys would be the first to admit that,” was boss for the day Ricketts’ assessment of the cup win. WOKING: Cole, Newton, Arthur, Clarke, McNerney, Murtagh, Payne (Jones, 69mins), Goddard (Lewis, 69mins), Betsy, Sole (Marriott, 86mins), Rendell.